Love the Original, but this... ? Not so much. I LOVED the original Prince of Tennis. I couldn't get enough, even after 178 episodes. When I found version II, for me, it was like, "YES! More Price of Tennis!" I guess its okay, like the original its not realistic but it is entertaining. The original really made you attached to some characters while this series din't focus on any character--audience attachment. Its okay if you have time to burn nothing to really be excited about. This is one of the best animes around. I am glad they are bringing back old characters and having some new characters as well. Ryoma is taller now and looks awesome. Although I really love Fuji. But WOW this is a must see for any anime fan who has seen the prince of tennis original. I really enjoy the Prince of Tennis series. I watched the original show when it aired on Toonami, and found the rest online later as it quickly became a favorite show. 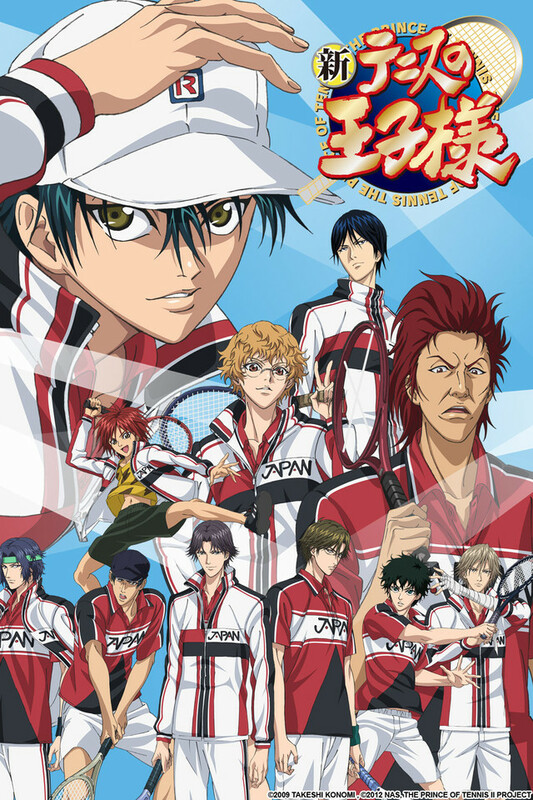 I've been a fan of tennis and anime since I was pretty young, so this show is an epic combination for me. I have two minor complaints about The Prince of Tennis II however. The first being that after the original series, the show took an even more "mystical" feel than before. Junior high students hitting shots that defy the laws of physics is enjoyable every now and then. But it goes a bit too far over time. The other complaint for the second season is that it is overall too short. It leaves a lot of questions unanswered, and ends on a cliffhanger. This show does have major potential though. I've watched the OVAs and am pretty far in the manga, and I believe this show could really pull through if they're given the chance to continue making it. I know that tennis isn't considered very popular in most places, but this series has helped spark many athletes to give it a go. There are 6 OVA episodes yet to be added to Crunchyroll. Possible that the show will continue after all! I can't help but feel that this series was a complete waste of my time. I watched the entire original series, not including the movies, and really loved it - but this sequel doesn't hold a candle. Over half of the short 13 episodes focus on their ridiculous wilderness training. The crazy training was the least interesting part of the first series and somehow here it became the main focus. We only see a handful of full matches, and they use abilities that cross the line from amusingly ridiculous to Dragonball-Z level. In the original, sure, people hit the ball stupidly hard, or with crazy spin. They were often impossible shots, but it was easy to see what they were exaggerated based upon. Here we have people hitting ten balls simultaneously. That's where it really lost me. Hitting multiple balls at once was too specific to be an exaggeration of something people can really do. For Kaidoh's snake you could always think "I've seen a lot of spin on the ball, this is just an extension of that". For ten balls at once there's no realistic comparison. It's the same with the beginning of the wilderness training. You have people climbing a steep rock face with no climbing equipment - someone even starts to fall to what will clearly be his death until someone catches him. There was nothing of quite that level in the original. And don't expect any of the characters to be fleshed out in any way, except a tiny bit for Tezuka. As someone who thoroughly enjoyed the original Prince of Tennis, I can't recommend strongly enough to avoid this one. I loooooove it and yet i still want more episodes ! New prince of tennis makes my love to some characters get stronger .....! I will never ever got tired from re-watching it ! I'm glad that POT is back. I remember sitting down after school and watching POT as best i could for marathoning. This is one of the few shows that always got me pumped up to see a big comeback or a big smackdown from one of the main characters. Although NPOT was pretty slow with the whole mountain training, I was thorougly excited to see Ryoma and the whole "loser" crew wear their amazing black jackets and come back proud and determined. I love the music. I enjoyed watching both the opening and ending every time. This is one of the best shows to get a motivational soundtrack going when you are down in the dumps. The characters that I loved and some that I loved and didn't get enough spotlight are all back and we delved deeper into their personalities. If you saw all 178 episodes of the original Prince of Tennis, and then saw the OVA's, plus the movie, and thought to yourself, "that's it? ", then this is the anime for you. If you never saw the original... go see it before watching this. The original series spent a LOT of time giving all the backstories of the junior high students, and showed them developing a lot of those special tennis moves, but you wouldn't know that if you just started watching it here. This season isn't as good as the original - but that's a pretty high bar to meet. It's still not bad, at least for the 11 or so episodes that have been released as of this writing. If i'm objective i've to conclude this is still a good anime. Subjective as an old POT fan i'm a bit disapointed in the last 2 episodes. Since I haven't read the manga i can't say how good it follows. But the story on it's own the idea is great no doubt. How they exploit it can do better however (in my opinion). POT was al about Tennis, the thrill and becoming better then you where 1 week ago. And to show this off they had exiting matches in wich Seigaku fought their way to victory. In POT II I can clearly see they are training, trying to become stronger. Trying to get to the higher level, but when they FINALY have the chance to show off their skill in a MATCH, the producer thinks 2 winning returns are enough to show how good they are??? POT used 3 episodes to cover 1 match, that's not neccesairy. But i think doing 5 matches in 2 episodes is tooo short/quick. The Characters are still just as awesome as in part 1, some have changed a bit but that doesnt make them bad. Animations are great, i dont think it's the state of the art but looking good none the less.